Continued from previous post: Nobody remembers Billy being blond. So what's with the blond hair and heavy make-up i.e. camouflage? Was he so spooked his hair turned from black to blond? 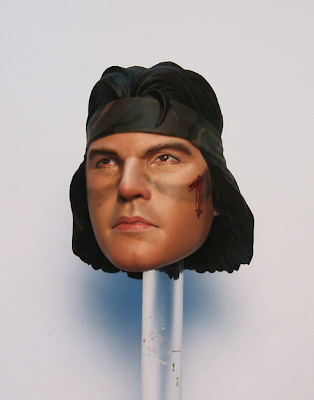 Word is the actual actor Sonny Landham did not give permission for his likeness to be used. We can only guess it could be due to financial compensation or lack thereof. 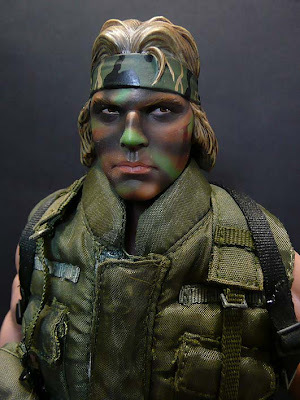 When Hot Toys first released their MMS (Movie Masterpiece Series) 1/6 12-inch Terminator action figures of Kyle Reese and a battle-damaged T-800, they also didn't have permission to use Arnold Schwarzenegger's likeness (see my post here and here). Closer inspection of Billy's head sculpt is in order. 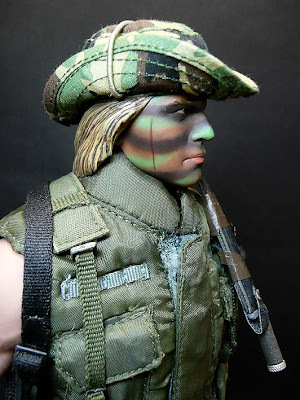 And here are repaints done by some very good painters which I came across on the net. 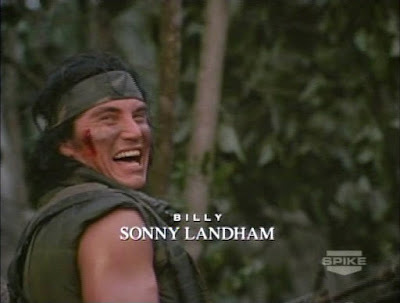 There is a Sonny Landham hiding under all that heavy camouflage make-up. They went into the jungles of South America to hunt guerilla fighters and rescue hostages but guess who ended up being the hunted! 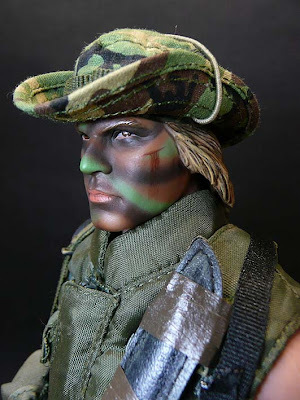 Full review of Hot Toys MMS72 (Movie Masterpiece Series) 1/6 scale 12-inch collector's edition Major Alan "Dutch" Schaefer with Arnold Schwarzenegger's likeness here. 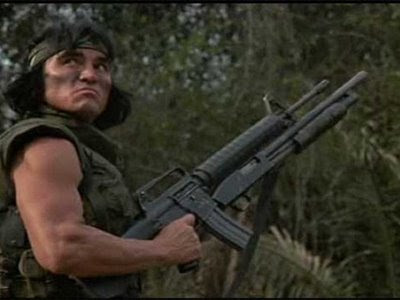 I heard that Sonny Landham didn't give HT permission to use his likeness? Is it true? Anyway, I think that Billy Sole's figure isn't selling that well over here in M'sia. Many stores are already selling it at a discount....one store was selling it for RM340...thats about SGD147! Hi Rebel, that's the word that was going around in the forums. SGD147 is indeed a good price for a Hot Toys product. I think one must be a fan of the first film to want to buy Billy, which I am. I want the whole team because they were really good when it came to exterminating humans but no match when it came to one alien. IF HT is releasing other human characters in the "Predator". Billy will be appreciated for a full complete "Predator" collection.. 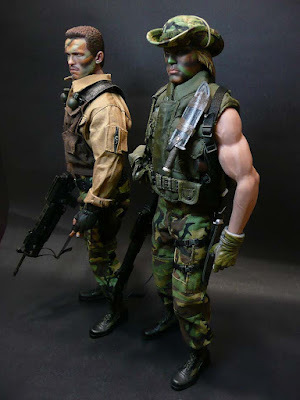 Hot Toys did release almost the full squad of USCM from the "Aliens" movie but the other characters just weren't that outstanding. 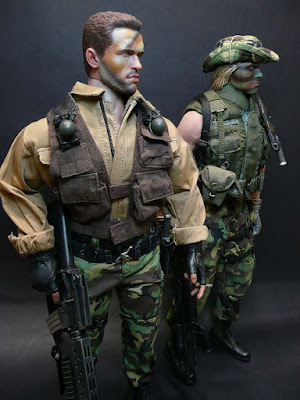 And if nobody's buying Billy, Hot Toys won't be releasing the others as they realize that most collectors only get Dutch & Predator. 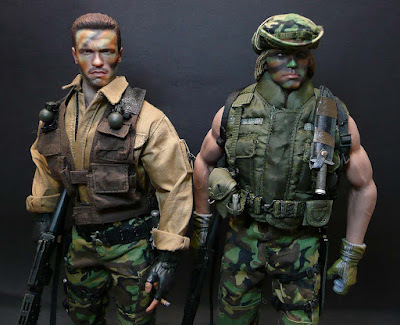 That's because Hot Toys' figures cost a lot more than Sideshow's (their Star Wars armor figures are priced very well), DiD's and Soldier Story but not as much as Medicom's. 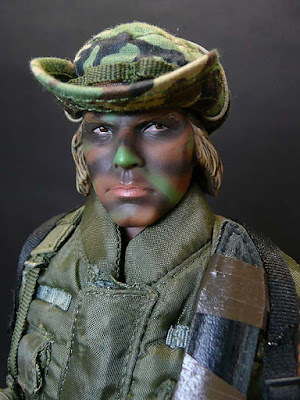 Who repainted your Billy? I've purchased one myself, and really don't have the skills to repaint. lydiadanea@hotmail.com Please lemme know. 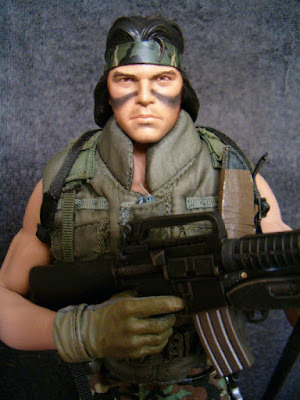 I am a fan of both Predator and Predator 2, and would love to get Blaine as well. Ah well, at least I have Billy Sole right? 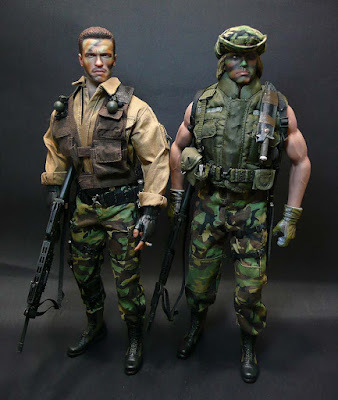 The Predator and Dutch are cool, but over appreciated and always available, I want the secondary characters! hey there lydia, as i mentioned in the post, the repaints are from pictures i saw on the internet so i really don't know who repainted Billy but they definitely did a real fine job with it.